Home/Our Staff Features/Where has the time gone? Hard to believe that it was 35 years ago that Debra Hollander decided that pet owners in the DC metropolitan area should have an alternative to boarding their pets or relying on friends/neighbors when they traveled … and thus Sit-A-Pet was born, giving them peace of mind that their pet and home were in good hands while they were away. In the summer of 2015 the staff got together to celebrate those 35 years and the wonderful pet sitters who have made it possible. 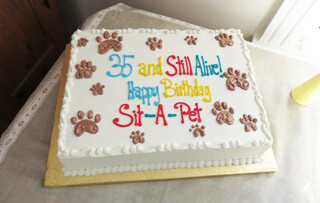 We look forward to serving you and your furry family members for another 35+ years! !